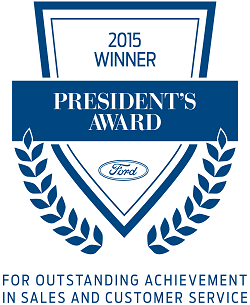 Plaza Ford Sales is very proud to once again be honored by Ford Motor Company for winning the 2016 President’s Award. This award is given to a select group of Ford Dealers across the country for excellence in Sales, Service and Customer Satisfaction. This is the twelfth time that Plaza Ford has won this prestigious award and is the only Ford Dealer in Sydney to have ever achieved this distinction. This latest award comes at a time when Plaza Ford is celebrating 25 years in business and it reinforces their pride in having served the area so well for so long. Plaza Ford would like to take this opportunity to thank its customers for their continued support but also to extend an invitation to those unfamiliar with the dealership to pay a visit, for an experience that will stand out from the competition.